It puts the whole family ministry movement in a format that will greatly help families. This little book is Gospel-centered. My friend Jared Kennedy was a part of making this book happen. My church is already making plans to pass this book out on Father’s Day. You can get it from Amazon.com or WTSBooks.com We want to give dads every encouragement to provides some spiritual leadership in the home. Coupon Code: Here is a special offer for our website readers. Use the special code LITCHRCHKUMMER to save 32% off retail on this book from WTSbooks.com – That means you’ll pay only $3.39 per copy of this very helpful little book. Here is a little video I helped make about the book. It gives some background and a peek inside the book. For more information check out Jared’s blog entry about the book. 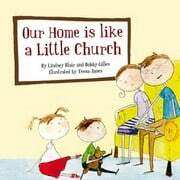 You can also watch that video about “Our Home is like a Little Church” directly on YouTube. We also have a resource page with Family Worship ideas and materials. Tony Kummer (Editor) reviewed & updated this page on : April 20, 2010 at 7:29 pm. All our content is peer reviewed by our readers, simply leave a comment on any post suggest an update.